WASHINGTON — At the College Park campus, University of Maryland students gathered Thursday afternoon at the steps of an administrative building to remember student-athlete Jordan McNair and to share competing calls to action. Some students were calling for a boycott of Maryland football games. “We’re students! And, we have student power! We run this university, not the administrators!” yelled one student supporting a boycott. But others, including Student Government Association President Jonathan Allen, wanted to pack an upcoming football game. The Student Government Association organized the rally and march in support of McNair, his family, and the university’s student-athletes. 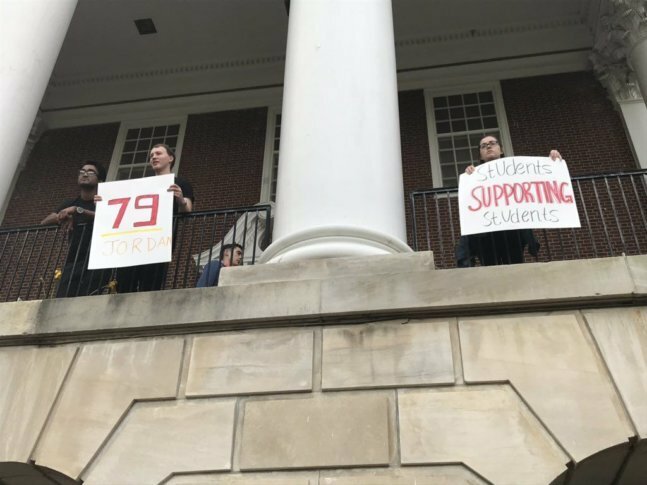 And though student government leaders are applauding the decision by university President Wallace Loh to fire football coach DJ Durkin, they say more still needs to be done now and in the future. The SGA also called for Jim Brady, the chairman of the University System of Maryland Board of Regents, to step down. Allen said Brady had failed the student body and campus community. A group of academic leaders, including the provost and dean of the University of Maryland, recently released a letter condemning the actions of the Board of Regents. In the letter, they said that the board interfered in university governance matters and undermined Loh’s authority. Loh is expected to retire in the coming months. In the longer term, Allen wants to see major changes that have a more direct impact on the broader student body. Right now, students pay nearly $2,000 per year in mandatory fees, and the largest chunk of that goes directly to the athletic department. Allen and Nambiar said that needs to change, and the SGA plans to adopt a formal motion that would do just that at a meeting next month. His proposal is to reduce that fee by 75 percent, and let students opt in to financial support of the sports programs in College Park, instead of providing students with a limited — though, lately, not often reached — number of free tickets to sporting events on campus. Student attendance at sporting events, especially football games, has become particularly sparse in recent years, even though the tickets are free and the venues that host the events are situated close to several high-rise dormitories.